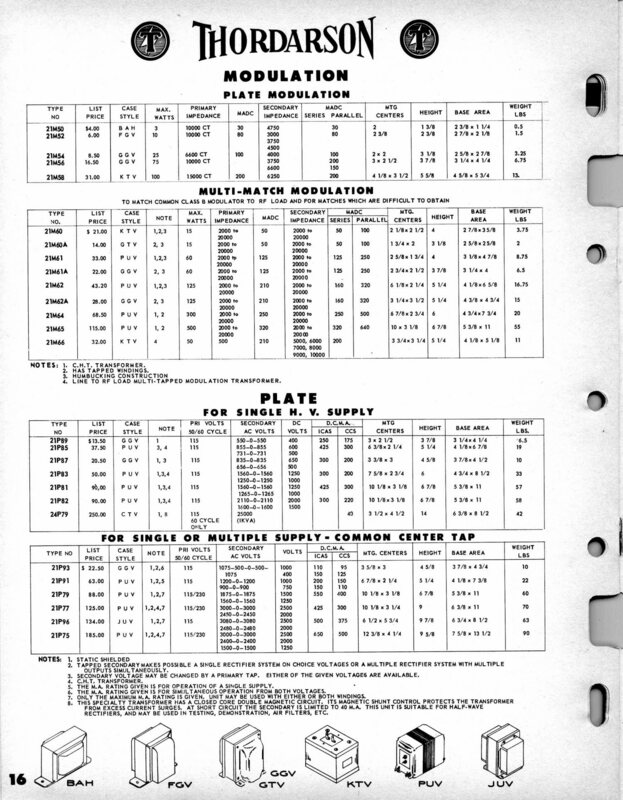 While perusing some tube data sheets (always fun) I came across a set of ratings in a GE data sheet for the 8156(1)(2) that included explanations. Maybe I had not paid much attention before but sometimes these ratings can be misunderstood. CCS: "Continuous Commercial Service (CCS) is defined as that that type of service in which normal tube life and reliability of performance under continuous operating conditions are the prime consideration." CCS duty cycle is 100% and extends until the end of the rated lifetime of the tube. ICAS: "Intermittent Commercial and Amateur Service (ICAS) is defined to include the many applications where the transmitter design factors of minimum size, light weight, and considerably increased power output are more important than long tube life. In this service, life expectancy may be one-half of that obtained in Continuous Commercial Service. Under the ICAS are such applications as the use of tubes in amateur transmitters, and the use of tubes in transmitters where transmissions are of an intermittent nature. The term "intermittent" is used to identify operation in all applications other than amateur in which no operating or "on" period exceeds 5 minutes and every "on" is followed by an "off" or standby period of at least the same or greater duration." ICAS service specifies a 5/10 duty cycle, which is 50%. IMS: "Intermittent Mobile Service (IMS) is defined to include those applications, such as aircraft, where the transmitter design factors of minimum size, light weight, and exceedingly high power output for short intervals are the primary requirement even though the average life expectancy of the tubes used in such transmitters is reduced. The tube ratings for IMS service are established on the basis that the transmissions have maximum "on" periods of 15 seconds followed by "off" periods of at least 60 seconds, except that it is permissible to make equipment tests with maximum"on" periods followed by "off" periods of at least 5 minutes provided the total "on" time of such periods does not exceed 10 hours during the life of any tube. Although the use of tubes under IMS ratings involve great reduction in tube life, such use can be justified as economical practice in applications where high power is intermittently desired from small tubes." IMS service specifies a 15/75 duty cycle, which is 20%. IVS: Eimac published the data for the 8873, 8874, and 8875 in a single data sheet(3) and provided IVS ratings for the tube. The ANODE CURRENT RATING AND TUNEUP PROCEDURE section states that the CCS anode current rating is 350mA and the IVS rating is 500mA. The rating is based on a 50% duty cycle and is applied to intermittent voice operation in A3J mode and intermittent keying in A1 mode, "which would be the normal single-sideband-suppressed-carrier or keyed CW operation" The average current in IVS operation is stated as 250mA. This bears out the 50% duty cycle applied to the 500mA rating. The data sheet also states, "For the 2000 Volt Intermittent Voice Service (IVS) condition, tuneup is recommended at 1500 Volts and reduced drive." The latter statement is intended to help the operator avoid damaging the tube due to excessive dissipation under random tuneup procedures. IVS service for tubes is given as a 50% duty cycle. The GE rating for ICAS and the Eimac rating for IVS appear to be the same, a 50% duty cycle and an avoidance of long "on" time in the ICAS and IVS conditions. The duty cycles for IVS are often very different for a tube and a power supply, primarily due to the characteristics of the power transformer. While the IVS condition for a tube seems to be a 50% duty cycle, one manufacturer has indicated that the IVS condition for a transformer is 28%, and bases this on an extremely high peak power level available from the transformer. The simplest explanation for this discrepancy is that a tube has rather small active surfaces and is delicate in comparison to a transformer. A transformer has a CCS rating, and possibly an additional ICAS or an IVS rating. The ICAS rating may be quite different from the IVS rating on a given transformer, although historically only one or the other seems to be stated, if at all. IVS: In the Ten-Tec Titan II manual(4), it is stated: "3.1.4 TRANSFORMER RATINGS : The transformer in the TITAN II is rated at 2.5 KVA CCS (continuous commercial service). It weighs 42 lbs. The weight of a transformer is directly proportional to the capacity of that transformer. A 35 lb. transformer may be rated higher by another manufacturer but only if different standards are applied, such as heat rise. Just for comparison , if our transformer was rated for IVS (intermittent voice service) or SSB operation only, It would be 9 KVA. In summary, your power supply is more than adequate." This amplifier output rating is "1000W continuous, RTTY, and SSTV. 1500W SSB and CW." The duty cycle for this transformer is 2500/9000, or 28%. In the actual application, the 9KW power level would not be reached even on peak signal. This explains the IVS ratings of “SSB” power supply projects in the Handbook, as well as common practice in custom-built gear such as the 3CX3000 "Jaws II" amplifier(5) using a 2700W (1760V @ 1.53A, 10 Ohm secondary DCR) transformer and full wave voltage doubler in a 6.8KW PEP output amplifier which consumes 10KW peaks at the anode. The amplifier was built for SSB but it will loaf along on any mode at 1500 Watts output. A 3CX3000 amplifier as described above, or indeed any larger-than-normal amplifier, should not be considered so differently than a regular 2-3KW PEP input store-bought ham amplifier of good quality. The plate transformer is after all quite similar in ratings and the idea with the 3CX3000 is to 'never' have to replace the tube. The Titan uses a single 4CX1600B. Assuming the transformer specification is right, the tube is the power bottleneck. Add one more of them and you basically have a 3200W tube to compete with the larger amplifier mentioned. Then you might be able to find out if the Titan II's 35LB transformer can really deliver 9KW peaks on a 28% duty cycle. Or perhaps the Jaws II's similarly-rated oil filled 120 LB transformer will prevail. In either case, “your power supply is more than adequate." -provided its transformer has a very low impedance. The IVS rating for a given transformer has much to do with the construction of the transformer itself. In most IVS rated power supplies, a full wave doubler or bridge rectifier is used with a capacitor input filter. Obtaining a high IVS rating depends on the transformer having a low impedance so that the I2R losses are minimized when the filter charges in short duration, repetitive pulses of many times the average DC output current. An IVS rated transformer is likely to have a wound hypersil core, but not all do. ICAS: In much of the older literature and transformer catalogs(6), the CCS and ICAS ratings are given for specific transformers. The ICAS current rating is not some 300% to 900% of the CCS rating, but only about 15 to 50% more. The goal was to provide two or more solutions with one piece of iron. The wide range of added current could have to do with the durability of the transformer or to do with the opinion of the designers or marketers as to how much amateurs and intermittent users could safely overload it. Older transformers with ICAS ratings have windings with smaller wire and much higher impedance (and secondary DCR) and were designed to operate into choke input filters. In those times, the very large capacitors now available did not exist economically, so a choke was used before the capacitor to help smooth the DC current. A notable example of a transformer with a CCS/ICAS rating is the original or replacement BC-610 transformer, the Stancor 52C046 military/Hallicrafters part number or P-9920 commercial part number. The rating for CCS (and military) service is 2500VDC @ 350mA. The ICAS rating is 450mA. On the low voltage tap, the 2000VDC is supplied at 500mA CCS and 625mA ICAS. In this case the higher rating probably reflects a slight reduction in reliability when the duty cycle is 100%. At some lower duty cycle not mentioned, CCS-like reliability should be had because the average transformer temperature is not exceeded and the transformer is not operated in saturation. Thordarson(7) provides similar specifications as did Chicago (8 ). UTC seems to have eschewed the practice and provided only CCS specifications. Up to a point, this kind of older transformer can be used with a capacitor input followed by a choke input filter to gain higher output voltage (capacitor input regulation issues apply). It is best to use a quite modest input capacitance, such as 2-4uF, as any great increase in peak current will cause I2R losses to increase, result in poorer regulation, reduce the average current available from the transformer, and cause overheating. The older transformers are still plentiful enough and well worth using if they provide the needed power and there is space to mount the slightly larger old-technology unit and for the additional filter choke. 3KVDC@1A is 3KVDC@1A. Looking at it another way, the heavier iron is an excellent way to keep the rack from tipping as easily. Comparing two example transformers having CCS ratings of 1KW, but one having an IVS rating and the other having an ICAS rating, assuming both are subjected to equal average power levels, is somewhat like comparing apples and oranges. The ICAS rated unit might do well with a small but frequent overload and the IVS one might do well with a normal average load but occasional very high repetitive peak currents. They are both good and each has a way in which it is best made use of. 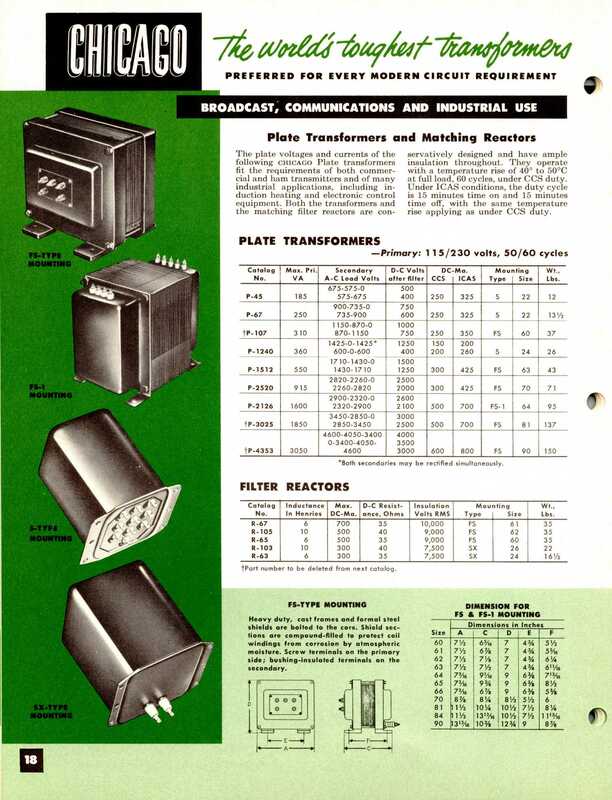 Small definite-purpose transformers intended for continuous or near-continuous use have been fitted with large finned heat sinks made of sheet metal to increase their ratings by controlling temperature, notably by Zenith in older color TV sets(9). These transformers are a cross between old ICAS rated types and new IVS rated types in that they supply a fairly constant current, they operate somewhat overheated (thus the fins) and they are frequently used where there is a capacitor input filter, or a choke input filter with a very small choke (1-2H) followed by a large capacitance of 80-100uF. Should we propose a posthumous "Consumer Electronics Service" (CES) rating?. Perhaps a 75% duty cycle based on a 24 hour day is appropriate. The whole structure of rating methods begins to look like the notorious audio amplifier ratings of days long gone, with RMS, IHF, Music Power, and IPP classifications to befuddle the poor consumer. Thankfully, many electronics hobbyists have the ability to understand the tube and transformer ratings and make proper use of them. As for the unwashed masses of the hobby, the various tube and transformer ratings are still subject to significant discussion in various sites and forums, indicating that there is still too much misunderstanding of the concepts among the hobbyist community(10). (2) A practical 20 Watt 2-Meter amplifier circuit is given in 73 magazine, January 1968.